Thanks for pointing out the typo for the Deathbringer. This has actually been addressed in v1.0b so do check out the new patch! Old saves are compatible so no worries! Thanks for the kind words aml435! Again, very glad you are enjoying the hack! Thanks for the kind words and very glad you are enjoying the hack! Hope this helps and thanks again for the great comments and suggestions! Thanks for the suggestion and stay tuned! Btw, just updated the hack to version 1.10. I added some extra stuff on this one so previous saves might be glitchy - ie. you might miss out on some extra weapons/items and the extra boss fights in the new area I added. It's advised that you start a new game...sorry about this part! Thanks for the kind words and much appreciated for checking out my hack!! Hope you'll enjoy the hack! Remember not to adjust the battle speed too fast unless you're super quick on your toes with the game, otherwise the game will get very challenging as soon as you're about 1/3 into the game. Glad to hear that you're very experienced with the game as I've designed the last dungeon/endgame of this hack to get very challenging even for veterans! PM/email me if you have any questions! Thanks for the kind words and your message! Yes, I used the FF4ed editor for editing the world maps. 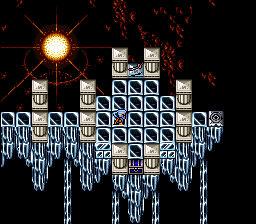 As for the new spells, it's just like you said, I toyed with the existing animation routines in ff4kster. And you are correct about the bomb's flame thrower summon. Feel free to check out the hack as well! Thanks for playing through the game and your kind comments!! Glad you found it interesting and hope you enjoyed it! Yes, the battle with the 'AI' you're referring to is designed to be very tough. Plus it scales with the players so leveling won't help much at all! Hope you'll enjoy the hack!